The new year and a new product from Thuraya Telecommunications Company ... the launch of its Thuraya Tracking and Monitoring (T2M) service in conjunction with the launch of its first product release of the year, the T2M-DUAL terminal. 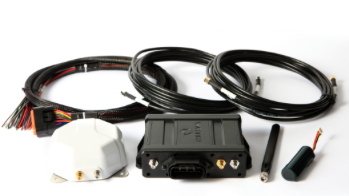 A mobile, dual-mode device for machine-to-machine (M2M) communications and remote asset tracking and monitoring, the T2M-DUAL enables the simultaneous collection of data from multiple points including location information, data from external sensors and peripheral devices, and input gathered from vehicle or heavy equipment CANBus. The T2M-DUAL’s system and interoperability render it a significant solution for widespread projects in sectors like transportation, logistics, energy, utilities, agriculture and mining. The solution brings unprecedented ease of integration to applications that are traditionally more complex to manage and monitor, such as vehicle tracking and fuel consumption, thereby resulting in operational efficiency. The new solution allows for the integration of any third-party applications and has several built-in smart features such as geo-fencing, network selection based on least cost routing, internal battery backup and location and sensor data. 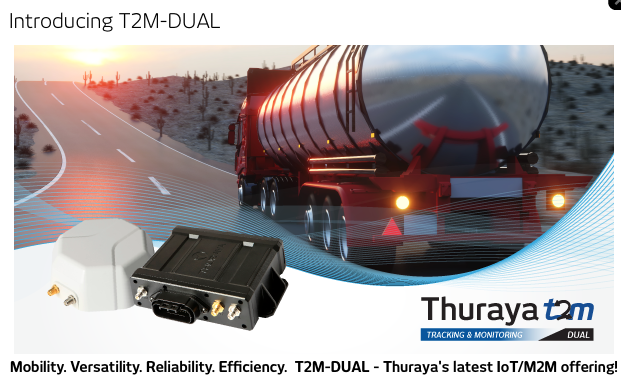 With dual-mode capabilities, T2M-DUAL ensures that connectivity is automatically maintained as assets move between regions covered by GSM and those that lie beyond the confines of cellular networks - under the strong and secure coverage of Thuraya’s satellite network. Rashid Baba, A/Chief Commercial Officer at Thuraya said that Industries and businesses are constantly looking for solutions that give them a competitive advantage with lower risks, higher automation and cost-saving potential. As more players enter sectors like logistics and transportation, for example, the monitoring of remote assets on the move by managers increase opportunities for faster decision-making, deployments, worker safety, and operational efficiency. Thuraya’s resilient network and IoT services already have a strong foothold across verticals that require high-security connectivity for remote, mission-critical operations. T2M-DUAL solution caters to these sectors’ evolving needs and we are confident that it’s well-placed to meet market demands. Thuraya T2M-DUAL diversifies the company’s growing M2M portfolio. Note that this is a separate and apart solution than the previously released solutions, the Thuraya FT2225 and the IP M2M service.